Sr Lieske (who is an integral part of the breast Course for Nurses) is getting married to Brad next Saturday. On Saturday, we had the pre wedding party at our house. It was lots of fun! There was masses of food and plenty of noise. Although it was Lieske's party, it was in fact a team party. Everyone who came are either involved with patient care at the hospital or part of the Breast Course for Nurses. I have never seen an estimation of how many health personel are involved with each individual who has been diagnosed with breast cancer. Obviously it will vary depending on the individual facility and the treatment a women receives. In our setting, at least 15 people are involved in the diagnostic phase. I have no idea how many people are involved if a woman is admitted for surgery. One day, we will have to try and estimate it. Even if we do that, we will miss out on all the staff involved in training and mentoring. Amongst the people attending Lieske's party were Sister Hill, (who had trained her), Sr Corriea (ward sister 11 B) and some of the nurses who had trained with her. She referred to her previous work family and her present work family. In the latter, she included Gadija and Nadia who work in our office, Gafsa, Margie and MaryAn from Morton and Partners, Anne Gudgeon, Judy and Carol from Well Woman Diagnostics. In true bride style, she forgot to thank Elaine, her mother, and Brad her husband to be! 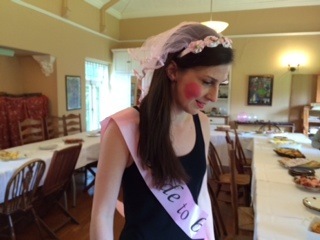 Lieske, you looked lovely in your pink tutu and pink bride-to-be sash. Have a lovely day next Saturday.